syndrome | MY LIFE AND LIVING WITH AUTISM. If you follow the road, we was in the first big house on the right. You can also see the rocks we climbed on when the sea went out. I have been back from my holiday now for 1 week. 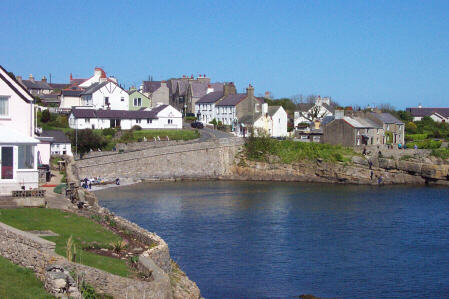 I dont think i told you, but we went to Moelfre in Wales. There isnt any attractions there but we chose it for a rest. People often book that place as sort of a basecamp. For example people will go to places like snowdon from there. It is a massive mountain what you can walk up. Infact i think it is the second biggest mountain in the uk. Ben nevis is first in Scotland. As i was saying we booked it for a rest. And i loved it. The beach was literally 30 seconds walk from where we was. There was also a rock wall that me and Tom loved to climb on. We climbed on it as much as we could. Unfortunataly there was 3 days that where ultra windy, so we obviously couldnt do it then. Tom loves climbing and it boosts his confidance way high. I love to see him like that. We visited quite a few places in the week we was there. My favourites where Bangor and newborough forest. Bangor had a big church and a few shops so we had a good look around there. Infact we went there twice. And newborough forest was great. There was three paths that you could choose from. There was a beginner one a medium one and a harder walk. I wanted to do the harder walk as it was 5 miles long, but we couldnt because Jessica couldnt have made it around. So we did the shorter one which was about 1.5km i think. This forest was also at the edge of a great beach, so we went on the beach for half an hour after the walk. We found a couple of nice shells so we put them in a little bag and took them home. All in all it was a fantastic holiday. The only drawbacks was i had to sleep in a bunk bed and we had no wi fi in the cottage. The wifi wasnt a massive deal but the bunk bed was. everytime Tom woke up he woke me up by getting of the bed. It wasnt his fault though. Also the bed i was in i only just fit. My feet was right at the end. We all loved it though. Infact we are going again next year but in a different cottage. Its literally across the road from where we was this time. And the cottage we was in this time, my Nan and Grandad and my uncle are going in that one. So that should be interesting. We also went into a pub and i bought everyone a drink. I also bought everyone a drink when we went in for a second time. At the beggining of the week i gave my little bro 10 pounds aswell so he would have some spending money. He bought a sort of gem rock. overall I had a great time and a good relax. Thanks for reading.